Tea time just got 10 times more stylish with the Mini Babanees Table by Green Cathedral. We’ve been fans of Green Cathedral and its lovely bespoke furniture since way back. The pieces have clean, simple lines, and are made of gorgeous solid oak with little tipped out legs and pops of colour in a rainbow of choices from fluoro to glow-in-the-dark. The Mini Babanees Table (from $350) shares its name with the piece that launched the Green Cathedral brand: the Mini Babanees stool. It happens to be just the right height for a collection of little stools to pull up around it, or if shared seating is the preference, there’s a matching bench too. 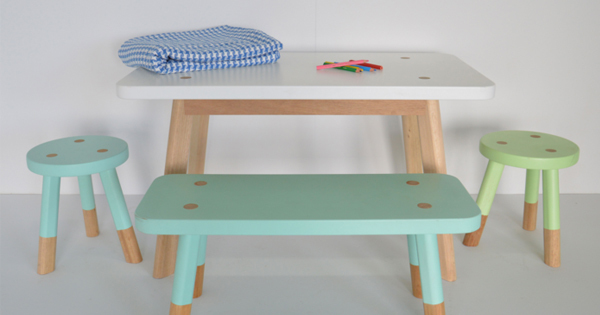 Like the stool, the table has peg legs that peek through the table top in little contrasting circles. It comes round or rectangular with smooth rounded edges. While the folks at Green Cathedral hold sacred the quality of their designs and materials, even they know you can’t give an oak table to kids at playtime and expect it to come out alive. An oak table top is begging to be decorated with textas, stickers and food. So the Mini Babanees Table top isn’t oak at all. There are two choices: MDF or marble laminate. 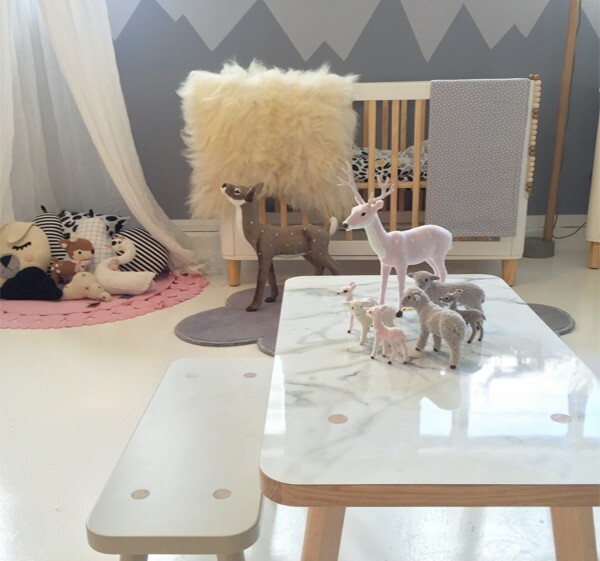 Stylish and wipeable – a parent’s dream. Like all Green Cathedral pieces, the Mini Babanees Table is made by hand in Noosa and will ship eight to ten weeks after the order is made. Get in touch for a delivery quote.